Visit Xiamen's quaint islands, colonial villas, and golden beaches, as you enjoy unique street eats and cultural puppet shows. Travel with Straits Times' foreign correspondents in weekly series Perfect Weekend. The south-eastern port-city of Xiamen, with its mild climate and colonial buildings, has always been a popular holiday destination for the Chinese, especially in the winter months. Formerly known as Amoy, the city, which sits on the coast of the Taiwan Strait, offers plenty to see, do and eat over a weekend. I choose Nanputou Temple as my first stop because it is a good place to take in the view of the entire city. The temple, set against lush hills, is part of an area comprising the Xiamen Botanical Garden and Xiamen University. One of the most famous temples in southern China, it is teeming with devotees and tourists when I arrive at about 10am. The temple offers free tours conducted by volunteers. My guide is an earnest devotee who helps me navigate the crowds and offers nuggets of Buddhist wisdom while explaining the temple's history. Then I head up the winding path to the top of Wulaofeng (Mountain of Five Old Men). After a 40-minute hike, I am rewarded with a panoramic view of the cityscape and the seafront. SilkAir and Xiamen Airlines fly daily from Singapore to Xiamen's Gaoqi International Airport. Flight time is four hours and 25 minutes. There are many accommodation options, from five-star hotels to small, quirky boutique hostels. Look up your options on www.booking.com. Narrow the search to the area you want to base yourself - the old downtown area around Zhongshan Road, the hipster village Zeng Cuo An along the coastal road or in Gulangyu. Try the JI Hotel (Xiamen Zhongshan Road, Pedestrian Street branch), a mid-range family-oriented hotel at the heart of the busy downtown. A good base for shopping and eating, rates start at $100 a night. Another possibility is Aifeier Holiday Hotel (Gulangyu Yuehai branch). A hipster hotel converted from an old villa, it is a three- to five-minute walk from Sanqiutian Harbour. Rates start at $80 a night. •If you have another day to spare, consider making a trip to Taiwan-controlled Kinmen, a 30-minute ferry ride from Xiamen. Or take a day trip to Jimei study village, the hometown of rubber tycoon Tan Kah Kee and a 30-minute car ride from the city centre. •If you enjoy running or have friends and family who run, consider planning a trip around the annual Xiamen International Marathon in January every year. The flat scenic coastal course is considered one of the best in China. Local participants have to ballot for a spot, but foreign entrants are automatically given one as long as they can show proof of previous participation in a half or full marathon, complete with name of the race and time taken. •Gulangyu can be crowded during popular Chinese holidays. Avoid visiting during Chinese New Year, the Labour Day holidays in the first week of May and the National Day holidays in the first week of October. •Foreign credit cards are usually not accepted. Use Chinese yuan or mobile payment apps such as Wechat Pay or Alipay, if you have these. •Learn some Chinese or have a translation app on hand. I have not tried using English in Xiamen and have not spotted many Western tourists. It is likely there will be very few locals who can speak English. At the temple restaurant, which is said to serve the best vegetarian feast in China, I go for the smallest four-dish set meal (118 yuan or S$24), which is good for two people. The stir-fried mixed vegetables, fried bee hoon, herbal mushroom soup and yam paste do not disappoint, though I cannot say it is the best vegetarian meal of my life. The family of five at the same table order a bigger set meal of seven dishes. Their mock meat dish must be very realisticas the husband keeps asking his wife: "Is this real meat?" The biggest set meal of 12 dishes costs 558 yuan while a la carte dishes are priced between 25 and 50 yuan each. The temple also sells vegetarian pastries for 12 to 58 yuan a box. The best-selling sugar and green bean-paste pastry is light and not too sweet. Next to the temple is Xiamen University, founded by the late Tan Kah Kee in 1921. The rubber tycoon who made his fortune in Singapore is known for setting up schools in Singapore and Xiamen. Having studied at Hwa Chong Institution, which he built in Singapore, I find the Xiamen University's style rather familiar. The tropical trees and flowers lining the roads, as well as the dormitories complete with colourful laundry lines, remind me of my other alma mater - Nanyang Technological University - also founded by overseas Chinese from Xiamen. The campus is open to the public, but be sure to have your passport ready for checks at the gates. There are helpful student volunteers at designated points in the campus to point visitors in the right direction. The back gate of the campus leads to a white sandy beach called Baicheng, also the start of famed attraction-rich Xiamen Huandao Road or Xiamen Islet Ring Road. The road along the eastern coastline is about 21km and most guidebooks say it will take five to six hours of cycling to cover the stretch. As I am also there for the Xiamen marathon, which includes a good part of the route, I decide to walk the stretch with the most number of sights. After strolling along Baicheng beach for about 20 minutes, I come across the Hulishan Fortress, a huge gun artillery built by the Qing government in 1894 to protect Xiamen against invasion. From here, catch a glimpse of the Taiwan-controlled Kinmen island. Continuing along the path for 40 minutes, I reach Zeng Cuo An village, a hipster enclave full of eateries, cafes, pubs and hostels. Here, visitors can sample street food such as satay noodles or shacha mian - similar to Singapore's satay bee hoon - and sandworm jelly or tusun dong. The savoury jelly, which includes pieces of protein-packed sandworms picked from the beach, is rather tasteless if not for the garnish of chopped garlic, coriander leaves and cucumber, and the mustard and soya sauce poured over it. I try a bowl of five pieces for 10 yuan. I am not a fan, but I would suggest giving it a try. After a pit stop at a cafe for a cold mango and coconut dessert, I head back to town for a hearty seafood dinner. A Singaporean friend who has lived in Xiamen for several years takes me to a local eatery which, according to reviews on popular food apps, is cheap and good. Apart from the fresh seafood, including scallops, bamboo clams and a large steamed fish, the Xiamen-style popiah (spring roll) leaves the deepest impression. Dried seaweed and other ingredients in the filling give it a taste distinctive from the Singapore version. It cost about 250 yuan for a meal for three. The seafood restaurant is in the old quarter of downtown Xiamen, where the roads are lined with five-foot-way buildings. Here, again, I see rows of restaurants specialising in seafood and Minnan or southern Fujian cuisine. Local delights are sold from roadside stalls. Catch a glimpse of Xiamen's largest and most popular fresh seafood market at the nearby Bashi, or the Eighth Market. By the time I get there at about 8.30pm, the crowds are thinning and some stalls are closing. But, according to my friend, the market stays open throughout the day. A trip to Xiamen is never complete without a visit to Gulangyu, a small quaint island with no motorised vehicles. 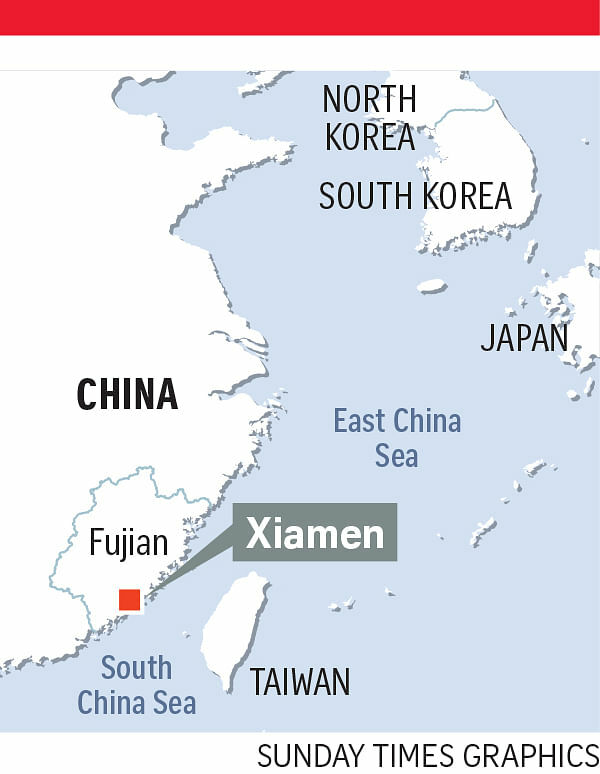 It is a 20-minute ferry ride from Xiamen island. I catch the 8.30am ferry from Dongdu Harbour to get in a full day there. Roaming the winding streets and armed with a hand-drawn map sold for five yuan on the ferry, I realise it is easy to get lost. Luckily, the entire island is just 2 sq km and, in no time, I get myself out of the hidden lanes onto the main thoroughfare after some backtracking. Despite its size, the island boasts some 1,000 villas in colonial and traditional Chinese styles. It was once home to 13 consulates from countries such as Britain, Spain, the United States and Japan. The foreigners brought with them their ways of life and architectural styles as they built churches, hospitals, schools and homes. From the early 1900s, overseas Chinese started returning after finding success in South-east Asia. The houses they built tend to be more extravagant and have hints of traditional Chinese designs blended with European-style structures. Here, I come across no fewer than a dozen couples posing for their wedding photos. Info: Ferries leave from Dongdu Harbour to Sanqiutian Harbour from 7.20am to 5.30pm every 20 minutes. A round-trip ticket costs 35 yuan. If you can read Chinese, go to www.xmferry.com for details. If there is one villa you have to see on Gulangyu, it should be Hi Heaven or Haitian Tanggou. You can observe the intriguing marriage of Chinese and Western architectural designs and learn more about the past of Gulangyu from the artefacts on display. There is a guided tour in Mandarin every 30 minutes. The highlight for me here is the puppet show, which alternates with a Nanyin musical performance every 20 minutes from 9am to 4.30pm daily. The hand puppets perform entertaining acrobatic moves such as somersaults. The Nanyin performance is more sedate, but still offers insight into the traditional performing arts of southern Fujian. The area around Longtou Road is the town centre of Gulangyu. Tasty street food and souvenir shops that sell tea and sweet green-bean pastries abound here. A local friend has told me there is hardly any difference in the teas and pastries sold in the shops here as they are all made in the same factories. The difference is in the packaging - girly, funky, European or Chinese styles. One tea shop has 10 tea bags packed in a vinyl record-inspired sleeve. Very cleverly done. •This is the seventh of a 10-part series. Next week, Philippines Correspondent Raul Dancel canoes on an emerald lake and kicks back at a bar with no name on Coron island.